The shield symbolizes the Army mission of National Defense and is divided into quarters representing the four traditional Military Science courses that make up the Senior ROTC curriculum. The Sword signifies courage, gallantry, and self-sacrifice intrinsic to the profession of arms. The Lamp denotes the pursuit of knowledge, higher learning, and the partnership of Army ROTC with American colleges and universities. The Greek Helmet is symbolic of the ancient civilization concept of the Warrior Scholar. 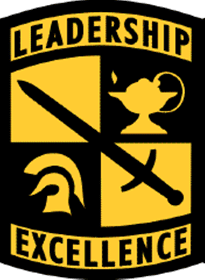 The motto “Leadership Excellence” expresses the ultimate responsibility of Army ROTC in the discharge of its moral responsibility to the Nation. I, (state your name), having been appointed an officer in the Army of the United States, as indicated above in the grade of Second Lieutenant, do solemnly swear (or affirm) that I will support and defend the Constitution of The United States against all enemies, foreign and domestic; that I will bear true faith and allegiance to the same; that I take this obligation freely, without any mental reservation or purpose of evasion; and that I will well and faithfully discharge the duties of the office upon which I am about to enter. So help me God.